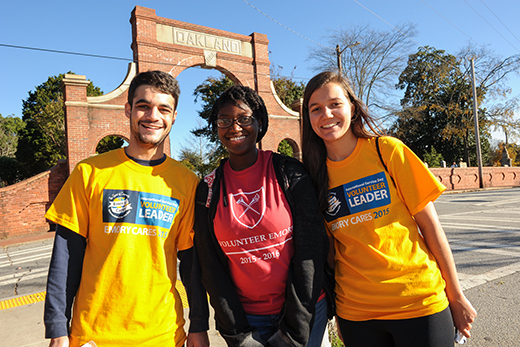 Emory Cares International Service Day is Saturday, Nov. 12, and students, faculty, staff, alumni and their family members are invited to take part in dozens of service projects in Atlanta and around the world. A signature program of the Emory Alumni Association (EAA), Emory Cares is conducted in partnership with Volunteer Emory and Volunteer Oxford and co-sponsored by the Emory WorkLife Resource Center. The event has increased its volunteer participation each year since it was founded in 2003. “Emory Cares International Service Day exemplifies Emory’s mission to create, preserve, teach and apply knowledge in the service of humanity," explains Latasia Woods, assistant director of regional volunteer engagement at EAA. Registration is now open for a diverse slate of Emory Cares service projects, from outdoor projects like landscaping to indoor efforts benefiting a variety of nonprofit and community organizations. While some projects are organized by the Emory Alumni Association and some by Volunteer Emory, all are open to anyone who wants to participate. This year, the EAA is organizing 14 projects in Atlanta, plus 50 more in cities around the world. Local projects with alumni include Books for Africa, collecting and shipping books to end the “book drought” in African countries; MedShare, sorting and packaging surplus medical supplies for developing countries; Lost-N-Found Youth, helping in the thrift store that raises funds to help homeless lesbian, gay, bisexual, and transgender youth; and many other efforts. You can view the full list and register on the EAA's Emory Cares page. Volunteer Emory currently has over 500 spots for Emory community volunteers, including undergraduates, alumni and graduates. Registration opened Nov. 1 and continues through Nov. 10 for 15 projects in the Atlanta areas. Service trips include helping with a pollinator-attractive planting project near Kaminsky Field with the Office of Sustainability; cleaning and maintaining school grounds at Sagamore Hills Elementary; beautifying the house and enjoying games and crafts with people with disabilities at the Hi Hope Service Center; building with the Mad Housers; and helping with the cat shelter at Furkids, among other projects. See the full list of projects and register on Volunteer Emory’s OrgSync page. “For our undergraduate volunteers, Emory Cares Day is a day to reflect on the greater network the Emory community is a part of and the importance of continuing our dedication to service and social justice after our time at Emory,” says Merry Zhai, director for Days of Service at Volunteer Emory. Oxford College alumni, students, faculty and staff volunteers will pack donated toiletries into shoeboxes for children in a Emory Cares service project benefitting the Newton County Foster Care program.